We regularly team up with different hotels around the UK to offer our One Day Wine Course and Discovery Day as part of a weekend package including an overnight stay on Saturday, dinner and breakfast. The packages are very reasonably priced from as little as £159 per person, so you can come along with your partner or friend or a group of you together - the more the merrier! 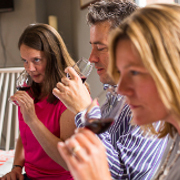 For anyone searching for an original way to celebrate a special occasion, treat a loved one, or just meet other like-minded people, our wine tasting weekends could be a great choice for you. Regularly joining forces with different hotels across the country, we aim to deliver you the best weekend packages, at reasonable prices. Our generous wine tasting weekend breaks include a one day wine course, meals and accommodation, and starting from a very reasonable £159 per person, it’s no wonder they sell out so quickly! We strive to provide you with a fantastic selection of wines at reasonable prices so whether you choose to accompany a partner, friend or family member on our exciting wine tasting weekend breaks, we are sure it will be an experience to remember. Book quickly to avoid disappointment! Our popular wine tasting weekends are hosted in cities throughout the UK, so there’s bound to be an event coming up soon that’s easily accessible to you. Popular locations include Cheshire, Buckinghamshire and London, so are excellent if you wish to combine a spot of sightseeing or shopping alongside your wine tasting weekend. If you’re someone looking to unwind after a busy work schedule, or just want to plan an exciting weekend away to look forward to, our wine tasting breaks are definitely worthwhile exploring. With our impressive range of wines, and relaxed atmosphere, a surprise wine tasting weekend could also be the perfect gift if you’re stuck for ideas for Mother’s Day for example. Wine tasting weekends are also perfect for meeting new people, and you could find yourself coming away from the experience with new friends to enjoy future ventures with. We understand that it can be difficult to find a wine tasting weekend that is informative but still enjoyable, but our wine tasting presenters are well known for their great sense of humour and ability to put you at ease. We’re always receiving positive feedback from our visitors about the entertaining hosts at our wine tasting weekends, especially from those who have always expected the experience to verge on being pretentious. Our wine tasting weekend is suitable for people with any level of experience, from experts of the craft to complete beginners. We explain everything as thoroughly and clearly as possible as we help you to explore the differing tastes found in wines from around the world. By encouraging you to detect individual flavours, we can help you to pick out wines we think you will most enjoy. One of the challenges we look forward to the most is persuading our guests to broaden their horizons towards interesting grape varieties. Whilst we aim to provide you with a greater appreciation for the wine you are sampling, the most important part of your wine tasting weekend is to simply ensure you have fun. It doesn’t matter if you are searching for a new hobby, companions with similar interests or just a larger list of wines to appreciate; we’re sure our wine tasting weekend breaks will prove to be a perfect choice for you. You can purchase an open dated gift voucher so that the recipient can book a date with us once directly. We'll automatically email you a link to the gift voucher to print off at home. If you prefer, we have printed gift vouchers that we can post to you or the recipient for £2 (select on checkout). If you wish to book a specific weekend simply click on one of the available dates listed below. Our Missenden Abbey wine tasting weekend is a great value break. The price is £159 per person (based on two people sharing a double room) and includes a full day tasting wine with lunch, Saturday night accommodation in the Coach House, dinner and breakfast on Sunday morning before checking out. If booking a single room there is a Single Room Supplement of £30, please click the link to add the supplement to your basket, or contact us directly to book. Note there is only one twin room at Missenden Abbey, subject to availability. In the North West, Frodsham between Liverpool and Manchester is one of our locations for our great value weekend wine tasting break. The price is £159 per person (based on two people sharing a double room) and includes a full day tasting wine with lunch, Saturday night accommodation, dinner and breakfast on Sunday morning before checking out. If you wish to book a single room, there is a Single Room Supplement of £30, please click the link to add the supplement to your basket, or contact us directly to book. There is plenty of parking should you choose to drive and it is a 7 minute taxi ride from Frodsham train station, with easy connections from Liverpool and Manchester. The hotel also has an indoor pool and spa facilities. Attended Chris's delivery of the wine tasting on Saturday at Market Bosworth. Wanted you to know how much myself and husband enjoyed it - sooo well done! Hi Erik, I have been recommending you to everyone, the weekend was fantastic and me and my wife thoroughly enjoyed the wine tasting.